Wildridge Contemporary Deep Seat Side Chair | ET&T Distributors, Inc. Innovative Technology - Poly resin has revolutionized the lumber industry. Not only is it kinder to the environment, but it produces a superior furniture product in terms of durability and longevity. 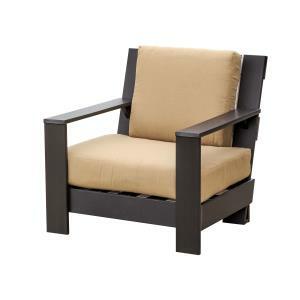 Our furniture is made from WILDRIDGE HDPE, a poly lumber with a high strength-to-density ratio. This creates a product that is exceptionally strong yet surprisingly lightweight. Poly furniture also resists rot and mold, and withstands all types of weather. There’s simply no better alternative for outdoor furniture that lasts.